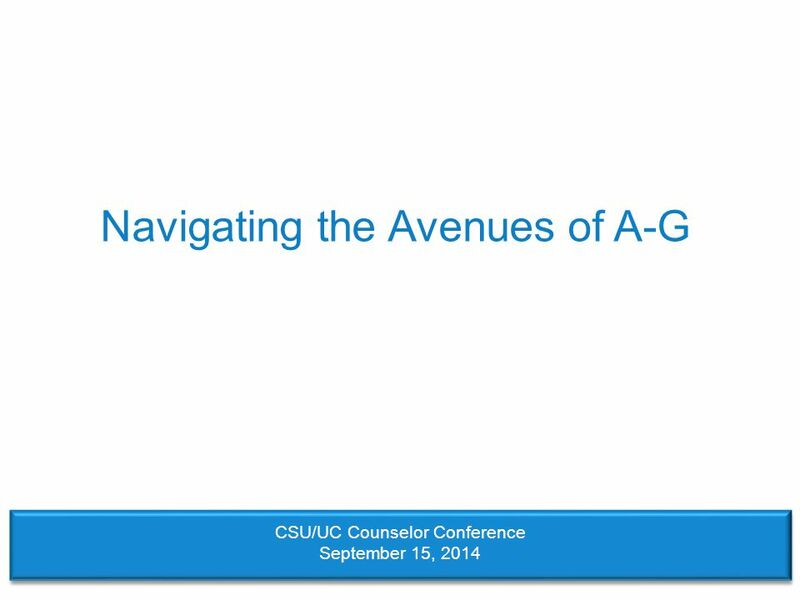 Navigating the Avenues of A-G CSU/UC Counselor Conference September 15, 2014. 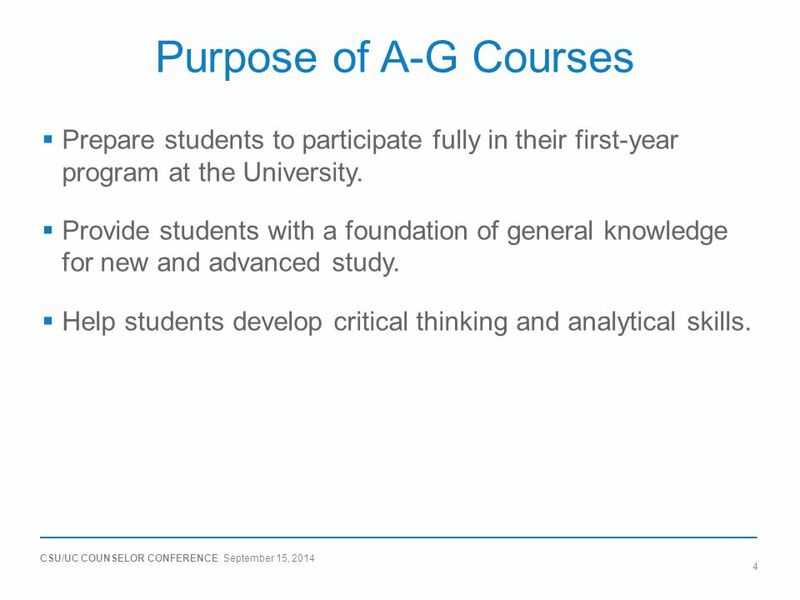 4 CSU/UC COUNSELOR CONFERENCE September 15, 2014 4 Purpose of A-G Courses  Prepare students to participate fully in their first-year program at the University.  Provide students with a foundation of general knowledge for new and advanced study.  Help students develop critical thinking and analytical skills. 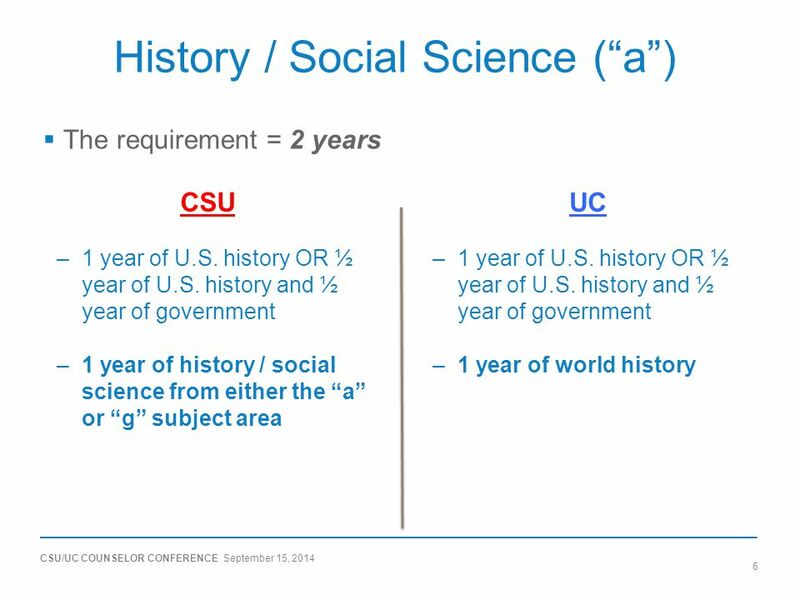 10 CSU/UC COUNSELOR CONFERENCE September 15, 2014 10 Language Other Than English (“e”)  The requirement = 2 years (3 year recommended) –Must be of the same language other than English  May use coursework from 7th and 8th grades. 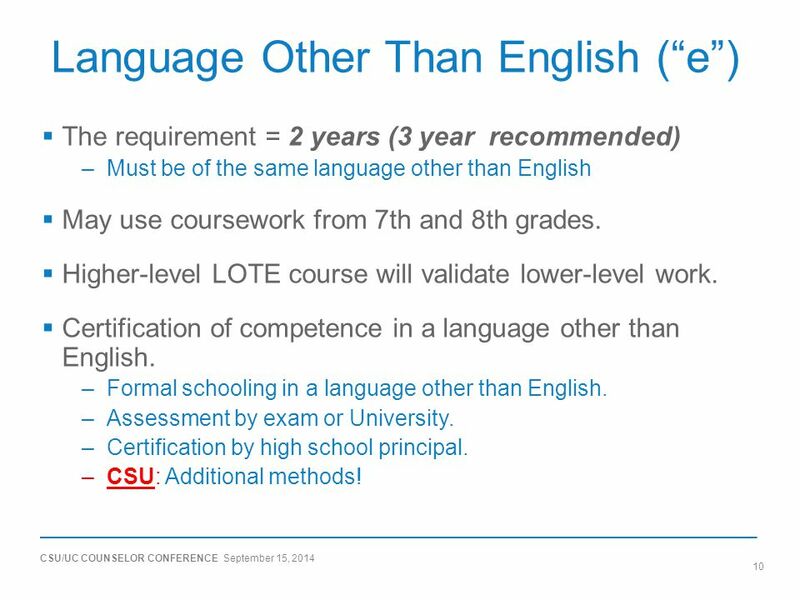  Higher-level LOTE course will validate lower-level work.  Certification of competence in a language other than English. –Formal schooling in a language other than English. –Assessment by exam or University. –Certification by high school principal. 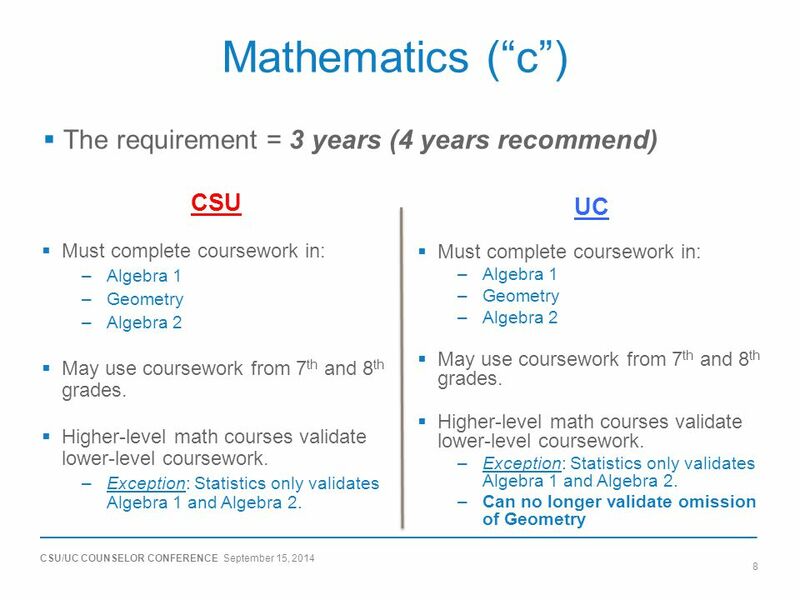 –CSU: Additional methods! 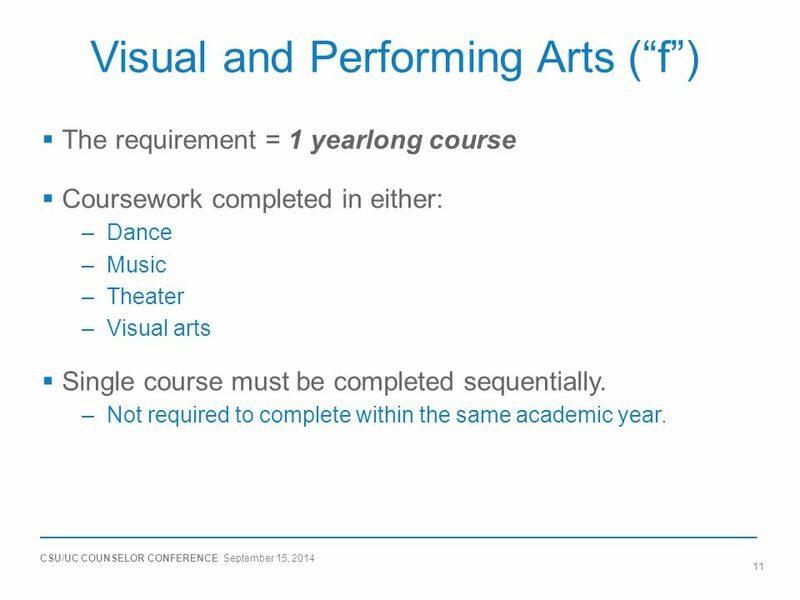 11 CSU/UC COUNSELOR CONFERENCE September 15, 2014 11 Visual and Performing Arts (“f”)  The requirement = 1 yearlong course  Coursework completed in either: –Dance –Music –Theater –Visual arts  Single course must be completed sequentially. 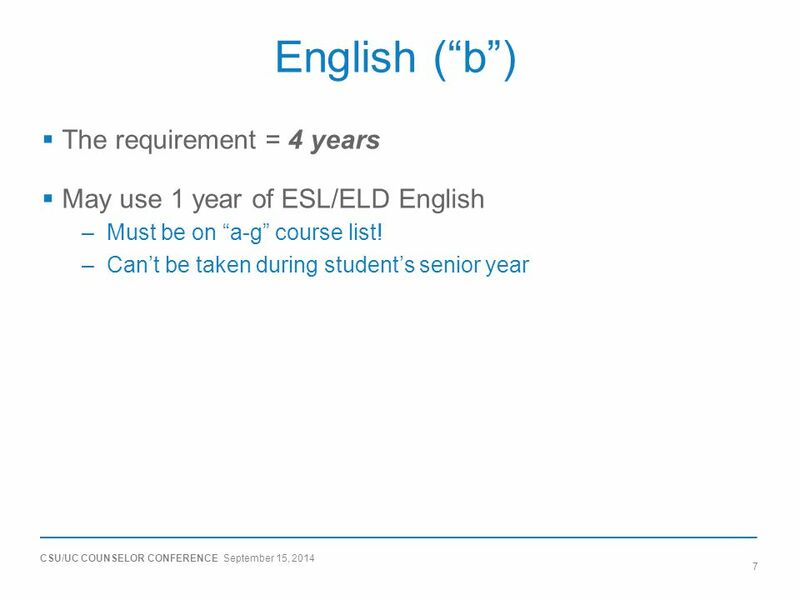 –Not required to complete within the same academic year. 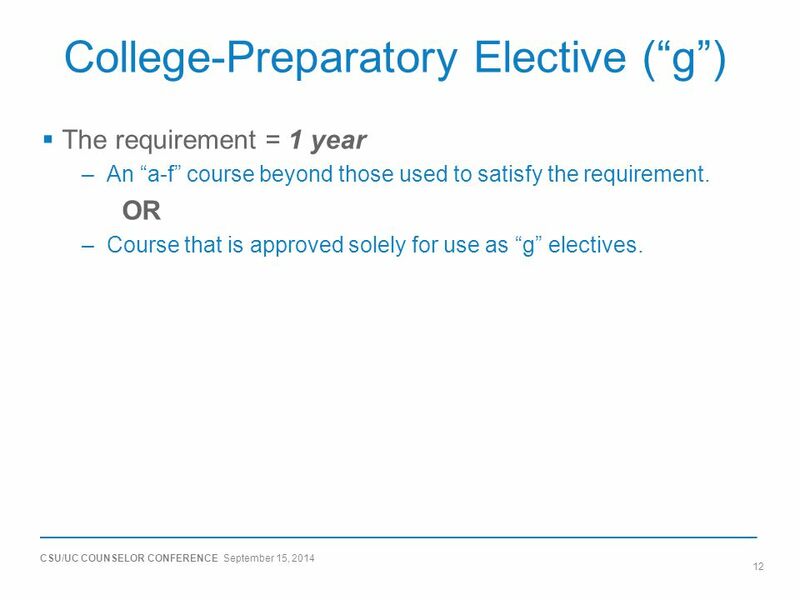 12 CSU/UC COUNSELOR CONFERENCE September 15, 2014 12 College-Preparatory Elective (“g”)  The requirement = 1 year –An “a-f” course beyond those used to satisfy the requirement. 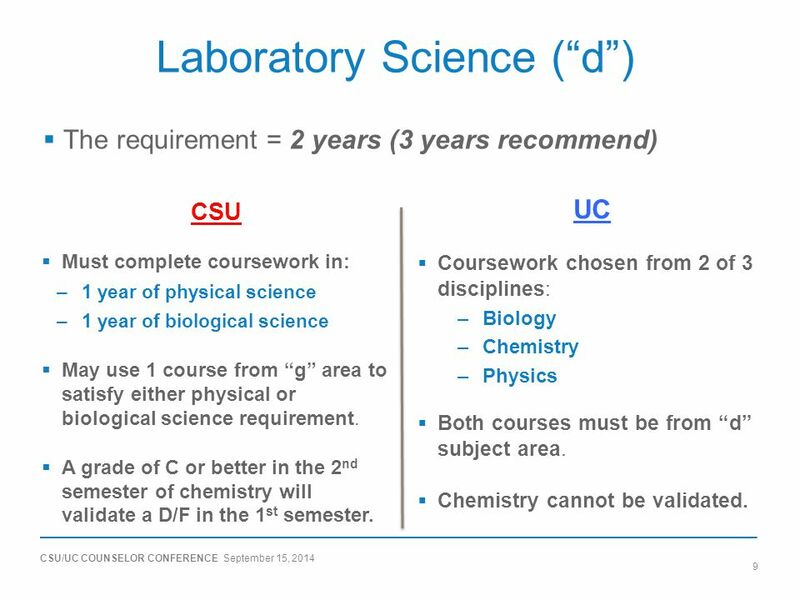 OR –Course that is approved solely for use as “g” electives. 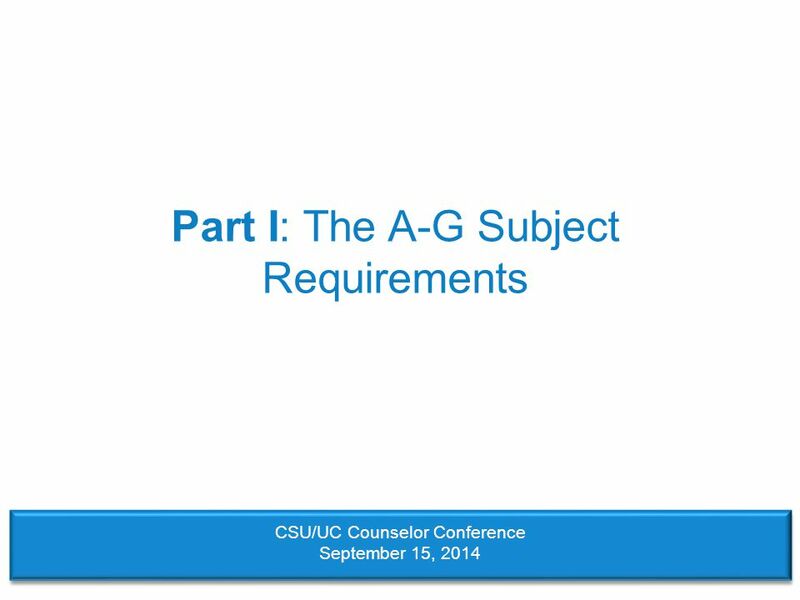 14 CSU/UC COUNSELOR CONFERENCE September 15, 2014 14 Satisfying A-G with High School Courses  Most common method of fulfilling the subject requirements. 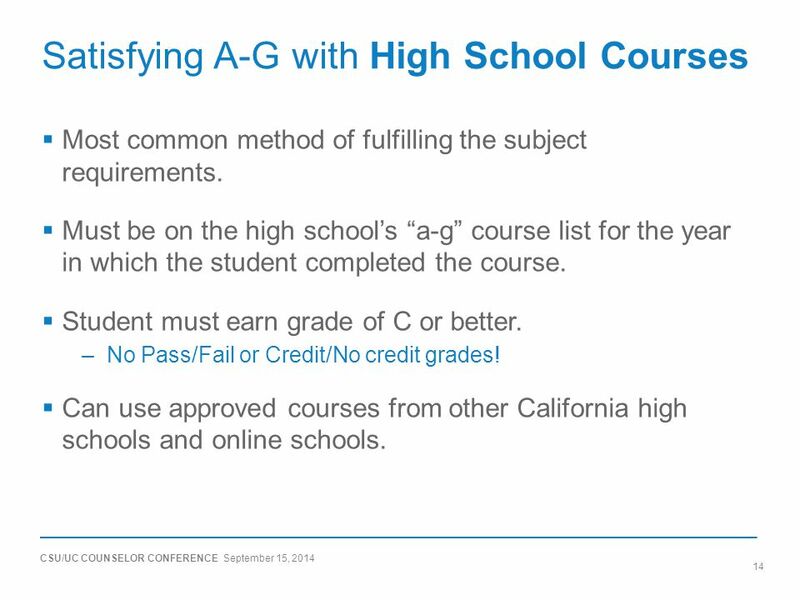  Must be on the high school’s “a-g” course list for the year in which the student completed the course.  Student must earn grade of C or better. –No Pass/Fail or Credit/No credit grades!  Can use approved courses from other California high schools and online schools. 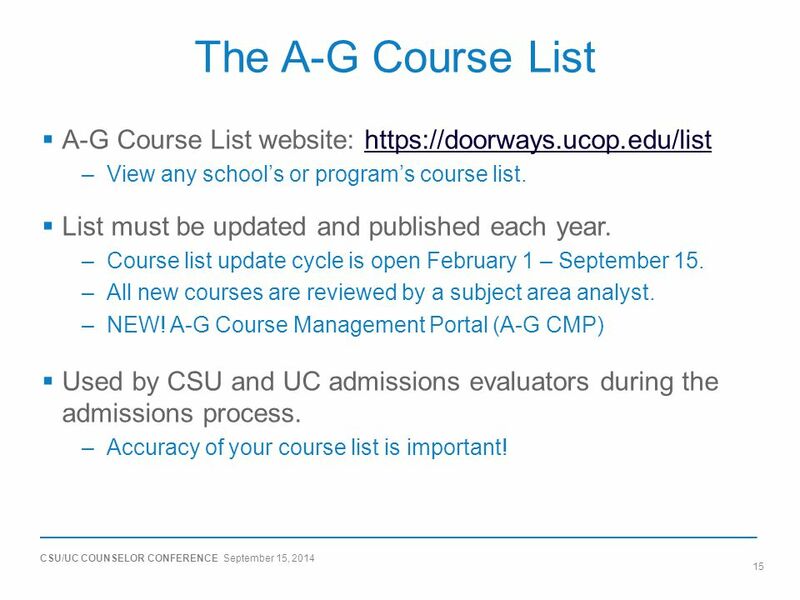 15 CSU/UC COUNSELOR CONFERENCE September 15, 2014 15 The A-G Course List  A-G Course List website: https://doorways.ucop.edu/listhttps://doorways.ucop.edu/list –View any school’s or program’s course list.  List must be updated and published each year. –Course list update cycle is open February 1 – September 15. –All new courses are reviewed by a subject area analyst. –NEW! A-G Course Management Portal (A-G CMP)  Used by CSU and UC admissions evaluators during the admissions process. –Accuracy of your course list is important! 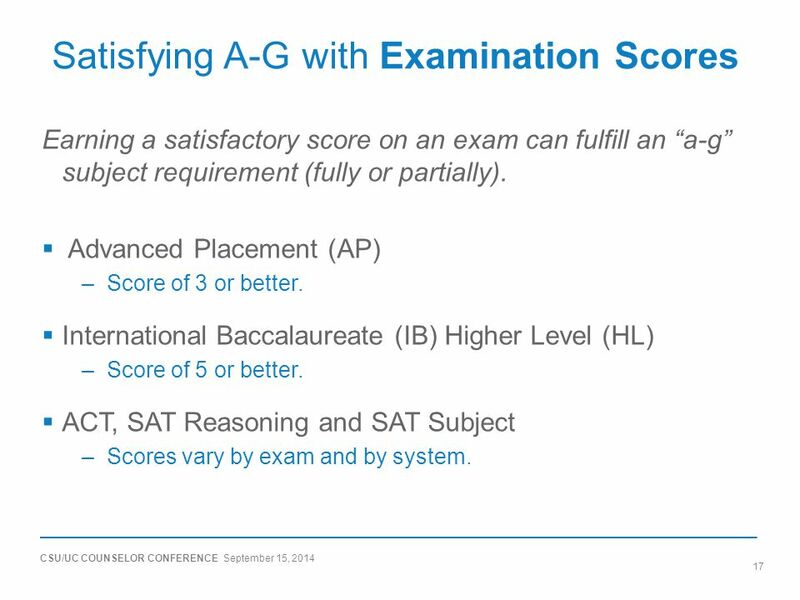 17 CSU/UC COUNSELOR CONFERENCE September 15, 2014 17 Satisfying A-G with Examination Scores Earning a satisfactory score on an exam can fulfill an “a-g” subject requirement (fully or partially).  Advanced Placement (AP) –Score of 3 or better.  International Baccalaureate (IB) Higher Level (HL) –Score of 5 or better.  ACT, SAT Reasoning and SAT Subject –Scores vary by exam and by system. 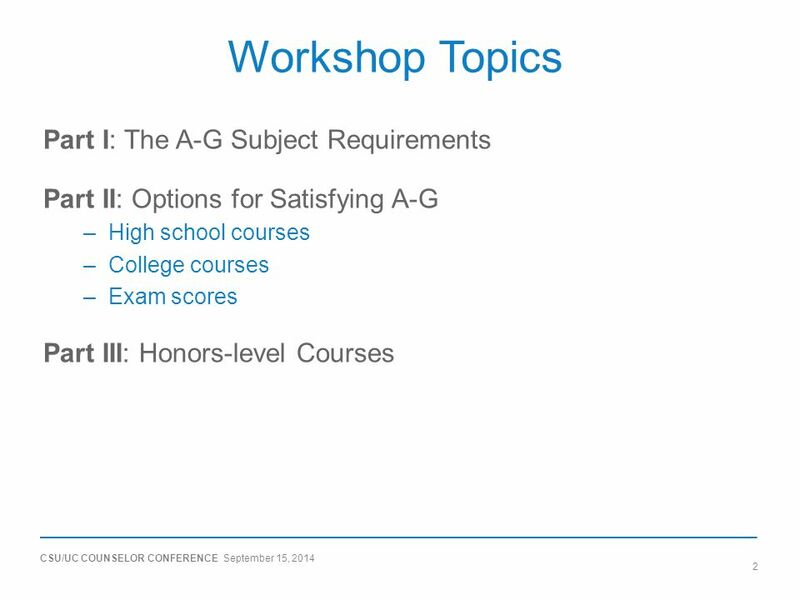 19 CSU/UC COUNSELOR CONFERENCE September 15, 2014 19 Types of Honors Courses  Advanced Placement (AP) courses –Only allow AP courses that have passed the AP Audit (or are in progress) to be placed on the “a-g” course list. –Schools must manually add AP courses to their list. –All AP courses (currently) receive the honors designation. 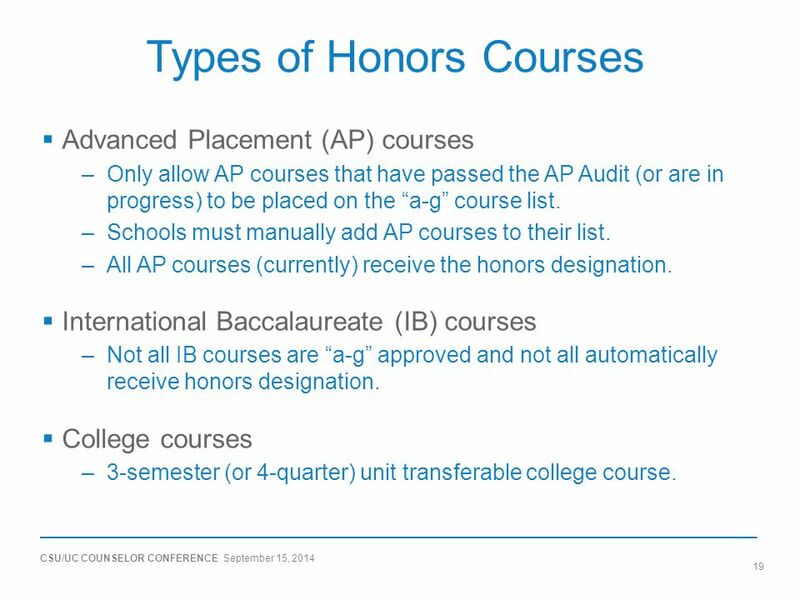  International Baccalaureate (IB) courses –Not all IB courses are “a-g” approved and not all automatically receive honors designation.  College courses –3-semester (or 4-quarter) unit transferable college course. 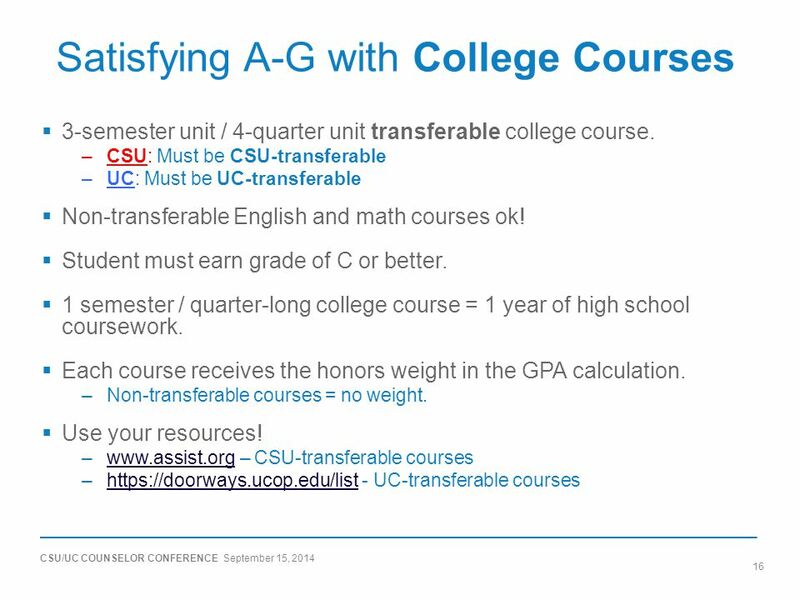 20 CSU/UC COUNSELOR CONFERENCE September 15, 2014 20 “Other” Honors Courses  Honors course policy revisions, effective 2015-16: –No limit on designated honors courses approved for an “a-g” list. –School-created, college-preparatory elective (“g”) honors courses eligible for honors designation. 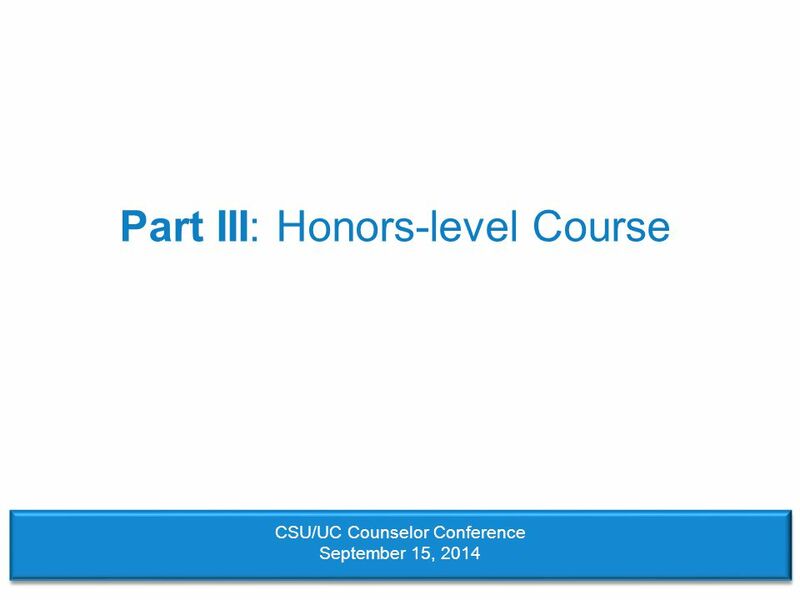 –Honors courses must have a non-honors equivalent, but simultaneous offerings not required. –Allow 10th grade courses to qualify for honors designation. 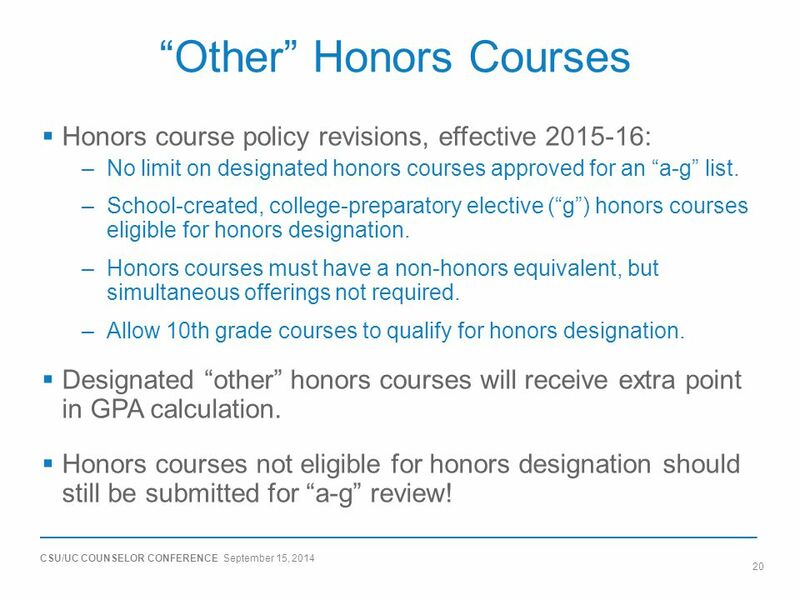  Designated “other” honors courses will receive extra point in GPA calculation. 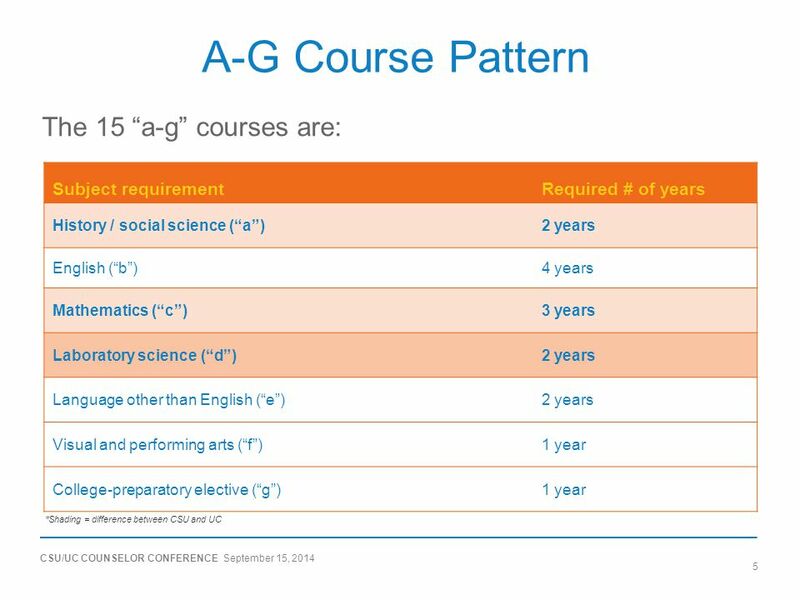  Honors courses not eligible for honors designation should still be submitted for “a-g” review! 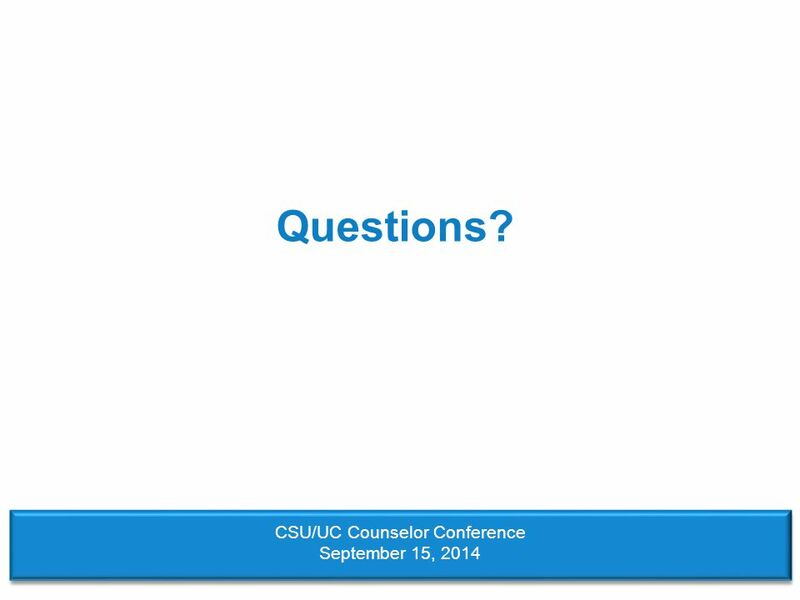 Download ppt "Navigating the Avenues of A-G CSU/UC Counselor Conference September 15, 2014." 15 high school classes you must take to go directly to a UC or CSU from high school. The classes that will prepare you to succeed in college. The only. High School Planning. Graduation Requirements In order to receive a high school diploma from Mesa Public Schools, students must: Complete the credit requirements. Going to High School What all students and parents need to know… 1. CCA 4 Year Planning. When you want to start creating a plan, remember… Include all courses required to graduate and for college eligibility.graduatecollege. 1 We Will Discuss: Counselor/Counseling Counselor/Counseling Confidentiality Confidentiality Grades Grades Credits Credits GPA GPA Graduation Requirements. December/January 2013/14 Classroom Presentation from Counselors February/March 2014 SMHS Field Trip 2/13 MHHS Field Trip 2/20 SMHS Presentation SMHS Select. Melissa High School Senior Seminar – Aug/Sept/Oct. Peaster High School Graduation Requirements. Which Program is Right for You? The Minimum Program is preparing you to go into the Workforce. The Recommended. 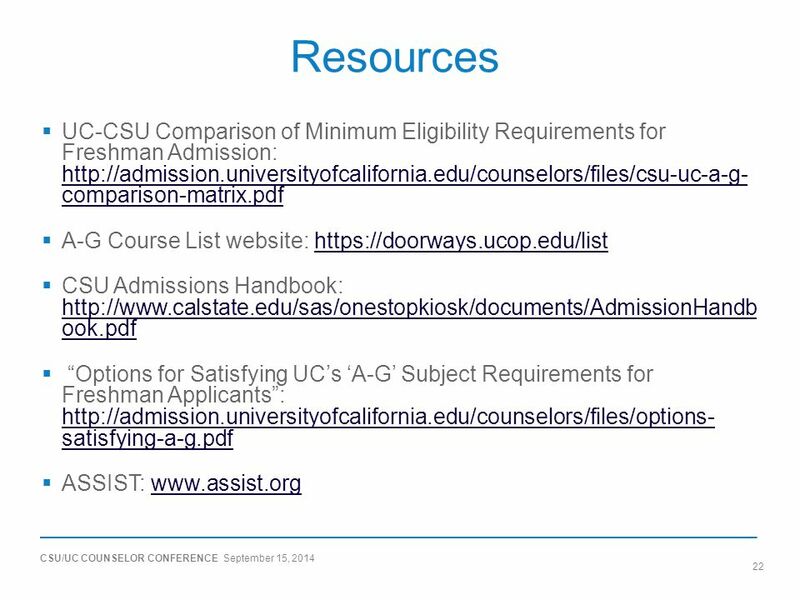 New Directions: Online Courses & the University of Californias A-G Subject Area Requirements Monica H. Lin, Ph.D. Associate Director of Undergraduate Admissions. Newbury Park High School Counseling Department Presents… Your Four Year Path & Beyond! WACAC – Share, Learn & Connect Conference 2013 UC Update Presented by Evera Spears University of California, Office of the President - Admissions Bay Area. Esther F. Garrison SVPR Counseling Office.  What grade 8 students have been doing to prepare for High School transition.  What is an Individual Graduation. 1 Going to High School What all students and parents need to know… 1. Class of 2015 Requirements. Promotion to the 12 th grade In order to be placed in a Senior Homeroom next year, Fall 2014, students must have earned the. Honors/Advanced Placement Information Night Information for the Academic Year Dublin High School February 12, 2014. Updated: 2/2014. Registration form is due to your science teacher Friday March 14 th ! If there is a possibility you might not be at IHS next year, register. California “a-g” requirements  Who uses them?  What are they used for?  What are they, and how will I meet them?  Does JFK offer everything I will.